When 98,000 Barcelona fans hold up red and gold cards during Sunday’s home match with Real Madrid, forming the biggest ever version of the Catalan national flag, it will confirm that the first of this season’s ‘El Clásicos’ is about far more than just the historic rivalry between two legendary teams. In front of a television audience of some 400 million people, nearly 100,000 voices in a sold-out Camp Nou are set to bellow “Independence! Independence!” at two carefully co-ordinated moments during the match. 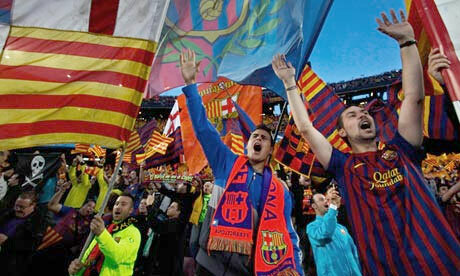 Not since Catalan flags – the red and gold striped senyera – were smuggled into Barcelona’s precipitous home in December 1975, weeks after the death of dictator General Francisco Franco, have the twice-yearly encounters between Spain’s two most famous teams been so dramatically politicised.